Because they are fun to do, I wanted to do some kind of bracket in March. I am resigned to the fact that I hit pay dirt when I did my Greatest HBO Character of All Time Tourney and since then, have routinely dismissed the idea of doing a bracket for cereal. The best cereal is Life. This is not up for discussion. I attempted a World Cup of Television during the World Cup a couple of summers ago but it became this giant hulking albatross that became too work-like and less fun-like. I scrapped that. Then, I think it was last year, I did something to try and determine the Wildest Wild Card but with that, I hit a wall because I kept running up against the same argument- eventually a wild card, no matter how wild, becomes known as a wild card. Thus, they inherently become less of a wild card. This year I am simplifying things, but it’s not because I’m lazy or anything. I intend to find out who is winning 2016 so far, i.e., who is winning RIGHT NOW. Why am I doing this? Two reasons. Reason no. 1: Really all anyone cares about is what’s happening right now. We don’t have the time or attention span to dwell on the past or forecast the future. Reason no. 2: Because of how we tend to forget things the further away we get from them, all of this stuff that has happened in this first quarter of the year will be forgotten by summer and a distant memory come the end of the year. When it comes time to compile year-end lists, The People vs O.J. Simpson, Kendrick Lamar’s Grammy performance, all that Kanye stuff and that kid from Room will be long-forgotten. So we need to celebrate the now, honor this easily forgotten first quarter of 2016. And that is what I intend to do- celebrate these first sixty plus days by determining who has won the first quarter of 2016- who is winning right now. I picked musicians, actors, television shows, media personalities, pop culture items and more; all of whom have had their share of high and low moments so far in 2016. If you made the tournament, it’s not necessarily a good thing- it’s more like a relevant thing. We can’t celebrate the good and ignore the bad. Although I am ignoring Donald Trump directly. He shows up in a handful on entrants, but he himself is not solely listed. I wouldn’t do that to you or me. There are four brackets, each named after a certain emotion that has been prevalent and persistent so far this year: Joy, Outrage, Anger, Relief. And there are naturally four number 1 seeds. Kendrick Lamar is the overall number one, followed by Kanye West, political outsiders and Sarah Paulson. Winners will be determined via noteworthiness, cultural importance, an internal back and forth and if needed, outside opinions. This is not science. My plan is to bang out each bracket in one post, that way this tournament goes quicker than the previous ones. With a little luck I’ll be done by next week. Kendrick is going to be hard to beat, both in the Joy bracket and when he comes up against the winner of the Anger bracket. In the Anger bracket, Kanye will be tough of course. But don’t sleep on Courtney B. Vance, who has been killing it on The People vs. O.J. Simpson and late second term President Obama. Over in the Outrage bracket, it’s full of destroyers of the Internet- whether it’s Game of Thrones trailers, Kim Kardashian West’s naked selfies or Spiderman showing up at the end of the latest Captain America: Civil War trailer. Sarah Paulson is the only person on The People vs. O.J. Simpson who can say she’s slaying more dragons on that show than Vance and seeing as how that’s The Television Show right now, that definitely means something. But she’ll have to beat some heavyweights to emerge from that bracket. Let’s see what happens. 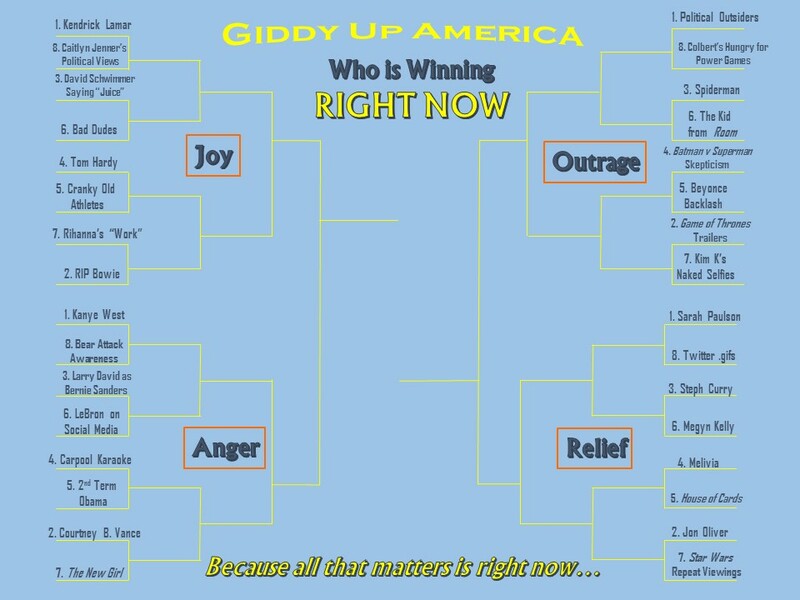 We’ll tackle the Joy bracket first.